Editor’s note: Glenn LaFollette is a finalist for 2018 Content Marketer of the Year. We’ll share insights from CMY finalists in the blog before the winner is announced at Content Marketing World this September. 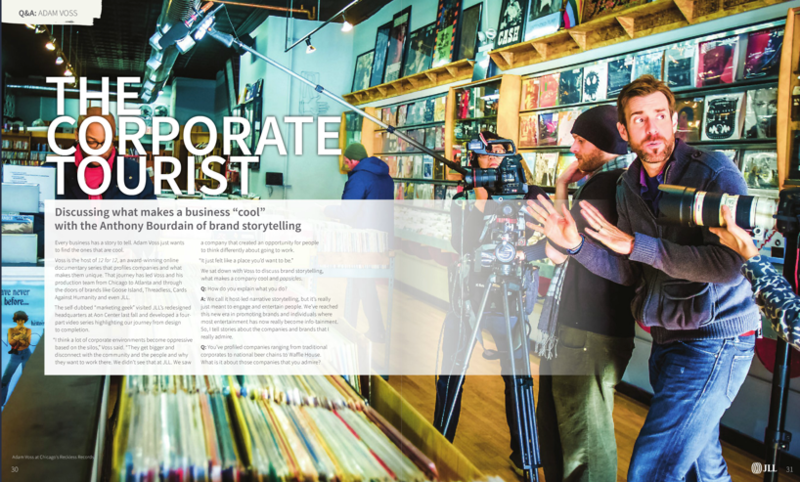 This callout from the second issue of JLL’s Ambitions magazine comes from an interview with Adam Voss, who the magazine calls “the Anthony Bourdain of brand storytelling.” The quote comes as Adam describes his award-winning online documentary series 12 for 12. Swap the word “art” for “commercial real estate services,” and you get a good summation of the philosophy underpinning the content marketing efforts at JLL. Glenn LaFollette leads the team bringing these stories to life at JLL. His work creating a magazine and multimedia website to share these stories earned the former sportswriter and newspaper editor a Content Marketer of the Year nomination. And his team’s drive to look beyond data about buildings to find the human stories happening within them holds some key lessons for content marketers. Glenn started at the global commercial real estate services and investment management giant as a public relations manager, then took over regional social media strategy. Today, he’s the senior manager of brand strategy. That means his and his team’s work gets viewed not just as content marketing or communications work happening separately from the rest of the business but as a strategic player in the whole brand. In February 2017, JLL shared a new brand position and look that reflected what the company thought it had always strived toward for its clients – helping them achieve their ambitions. The “Achieve Ambitions” message came from the company’s belief that every accomplishment begins with a unique ambition. The new branding was intended to reinforce the personal touch JLL values for its clients, setting a tone and visual approach much more human than what the company had done. JLL CEO Christian Ulbrich thought this tone reflected the collaborative, curious, and confident nature of the company. JLL’s Americas team had considered the idea of a magazine before the rebrand. During a global team meeting (which brings together representatives from the Americas, EMEA, and APAC marketing teams) in 2016, JLL Americas CMO Jill Kouri saw work that a team in India had created. The project took a digital platform and turned it into a physical magazine. While the potential was exciting, the team decided to wait for the right opportunity to launch a brand content hub. The company rebrand offered that opportunity. Ambitions Magazine and the Ambitions website launched in October 2017 and became a unified source for the company’s story. JLL’s content model traditionally revolved around email campaigns, research, and public relations. 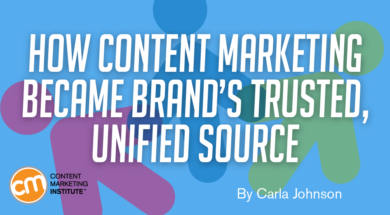 Beginning in 2017, the team began focusing on developing content to generate true demand rather than fulfilling requests from sales representatives for ad hoc content. What was missing was the brand’s story, which wasn’t always conveyed with a white paper or research report. The Ambitions program set out to unify brand efforts. The Ambitions publication focuses on stories, trends, and topics relevant to JLL’s clients and the larger real estate industry. Glenn’s team consists of himself, a creative director, an art director, and 7-10 writers, and support from shared production and design staff that serve all of JLL Americas. The internally developed magazine is an editorial blend of content from internal communications, public relations, and service lines such as the Project and Development Services (PDS) team. As the editorial director, Glenn also writes content, rewrites stories from other groups, and checks the quality of everything produced. 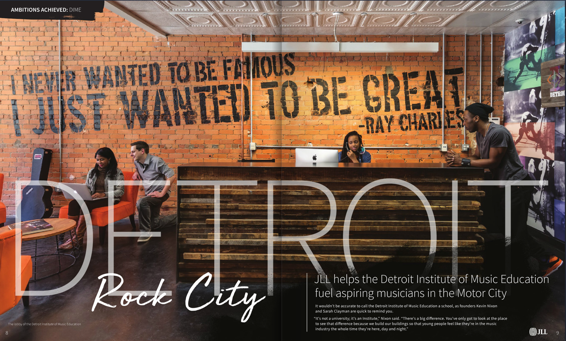 In the latest issue, for example, Ambitions features the story of the Detroit Institute of Music Education (DIME). For this project, the PDS team took an abandoned building and turned it into a beautiful space that accommodates the sound needs of a music school. The DIME story is told in the magazine through interviews with the clients and the PDS team members who worked on the project, plus photos and graphics. Once the physical magazine is out, Glenn and team expand the legs of the magazine stories online (e.g., using the bottom of the magazine subscription page) and videos that tell the stories of what the design of a physical space means to clients. Ambitions also covers employee stories. One example is the story about an engineer who earned a patent that has the potential to save 500 lives a year. “We’re creating magazine, digital, and video layers, and using them in a smart content plan to make sure we’re telling the right story in the right place,” Glenn says. This approach also affects how JLL Americas employees look at the work that’s being done and the shift from traditional case studies and statistics toward storytelling. It’s an internal education process that teaches people that storytelling isn’t about a complicated three-act structure, it’s about finding the human element in the work that JLL does and leading with that. “Our clients and prospects are deluged with content all the time. If we can take a case study and turn it into a 400- to 500-word human interest piece, that helps us stand out,” he adds. The first Ambitions issue was focused on workplace and designed as an annual publication. Its print run of 3,000 copies was distributed across JLL Americas offices and client events. That first printing generated 2,500 subscribers. The second issue, launched in 2018, focuses on design and features an increased print run of 5,000 copies. Glenn and team aren’t resting on their successful content formula, either. The design-theme issue features a new blend of content that includes research and thought leadership from across all of JLL’s product types (office, industrial, retail, and hotels), plus branded film versions of the three stories in the issue produced with the help of an external team. To find out live who is named the 2018 Content Marketer of the Year (and lots of things to help your content marketing program), register today for Content Marketing World Sept. 4-7 in Cleveland, Ohio. Use code BLOG100 to save $100.